Real-Time Ultrasound - Pamela Morrison Pelvic Pain Physical Therapist, P.C. 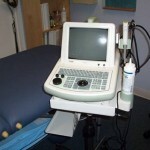 Real-Time Ultrasound - Pamela Morrison Pelvic Pain Physical Therapist, P.C. Patients can view their muscle function related to lumbar, pelvic, and bladder functioning. Patients can appreciate their function while viewing the actual anatomy being tested or assessed. For instance, a patient can view their bladder and how a pelvic floor contraction effects its position.